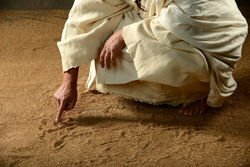 Home » Christian living » Sinless perfection? does God expect me to be perfect? Do you believe it is possible to achieve sinless perfection? Yesterday I was listening to a pastors sermon, and he told his congregation how Yehovah (God) had given Israel the law of Moses, expected them to be perfect, but they failed miserably at it. He continued saying how Yehovah knew this would happen, but He gave them the law anyway because it pointed to Christ in the future and their failure at obeying the law would strengthen them in their faith in Christ when He came. I dont know if you have heard sermons like this one, but I guess if you are a part of mainstream Christianity, you have heard something similar. Mainstream Christianity seems to have this idea that says God gave His people a law it was impossible for them to obey, but He did it anyway knowing full well they could not obey it. Is this what the Bible says? 1.John 5:3 and Deut 30:4 says it is easy to obey the law of Moses, so the Bible in itself disagrees with the pastor I heard preach yesterday and with most of mainstream Christianity. So we have to make a choice, who are we going to believe? The Bible or our pastor? We should, of course, believe the Bible and not our pastor because the Bible was written by Yehovah and He is the one who will hold us responsible for our actions in the future. So we know by now the Bible says you are expected to obey the law of Moses, it is easy to do, and we know 1.John 3:4, 3:7, 5:3, 2:6, John 14:15 says obedience to the law of Moses makes us righteous and unites us with Yeshua (Jesus Christ). The Bible also says in John 14:15 obedience to the law of Moses is what shows our love for Yeshua. Most pastors today would tell you it is impossible to obey the law of Moses because of our sin nature. So they would agree with the above scriptures, but then they would tell you it is only possible to be righteous by faith in the one who obeyed the law for us. The Bible says we are righteous by what we do, not by who we believe in (1.John 3:4, 3:7, 5:3). It also says if we believe in Yeshua we will obey Him and show our love for Him by obeying the law of Moses. (John 14:15, 1. John 2:6). What the Bible is saying is this: If you believe Yeshua died for your sins it will show itself in a continued decision every day to obey the law of Moses. So once more we have to make a choice, who are we going to believe? The Bible or our pastor? We should, of course, believe the Bible and not our pastor. So we see one more time how the Bible says you are expected to obey the law of Moses if you believe Yeshua died for your sins. This means that if you are saved, your salvation will show itself in a daily decision to obey every commandment in the written law of Moses that applies to your gender living outside of Israel without access to a temple. So you can not be saved and eat unclean food, you can not be saved and ignore the Shabbat. (James 2:10-26). Does the Bible expect you to have achieved sinless perfection? Most pastors would say yes, the old testament and the law of Moses expected Israel to be without sin. In the new testament, 1.John 3:9, it says if you are saved you can not sin. So it seems at first glance as if both the old and the new testament says we are expected to have achieved sinless perfection. If you read the law of Moses in the book of Deuteronomy, you will soon see how it expects us to commit unintentional sins. Nowhere in the Bible do we see Yehovah telling Israel they have to be perfect and never sin unintentionally. Intentional sin, on the other hand, is a serious offense in both the old and the new testament. We see this in 1.John 3:9 and Hebrews 6:4-6 says intentional sin after having received salvation will cause you to lose your salvation and never get it back. If you are a mainstream Christian, you are already guilty of eating unclean foods and ignoring the Shabbat. Both of these things are a sin (1.John 3:4), but if it is done out of ignorance or because your pastor told you it is not required for you to eat clean food and keep the Shabbat, your sin is unintentional. 1.John 1:9 says Yehovah has promised to forgive every unintentional sin. Yehovah sees that all the times you sinned against Him and ate unclean foods and ignored the Shabbat, you did it because you were deceived and He knows you would not have done it if you knew the truth. Now that you know what the Bible says about these things you can not continue eating unclean foods, ignoring the Shabbat or breaking any other commandment in the Torah. If you do, it will transition from being unintentional to becoming intentional sin, making this transition is very dangerous. As a believer obedient to the Torah (the law of Moses), believing Yeshua died for your sins, you will never be perfect. There will still be times when you will commit unintentional sins. 1.John 1:9 says when you do it is so easy, you only have to ask for forgiveness and repent. Sinless perfection is something we will never achieve on this side of heaven and this side of the New Earth. But we can, and we should strive for achieving perfect obedience to the law of Moses, something which makes us righteous by faith.